When you’re searching for a corporate gift with functional, stylish staying power, consider an umbrella – 45% of consumers own one – and with good reason. Umbrellas are useful year-round, can be given to recipients of any age and gender, and have dozens of options when you’re looking for the best match to represent your brand, occasion, or event. 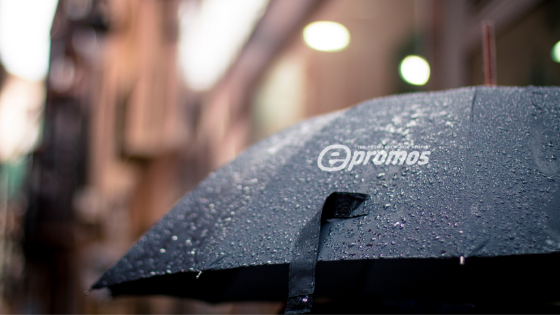 Here are 7 reasons why a custom promotional umbrella should top your list of go-to employee gifts or giveaways. Personalized umbrellas show off your business name or logo as part of a thoughtful, functional gift with maximum versatility. Whether you’re trying to stay dry during New Orleans’ rainy season or seeking a little spot of shade in sunny Phoenix, an umbrella is useful anywhere in the country. We like to stay in tune with how the weather is going to impact our day. With the convenience of an app just a tap away, we check the forecast an average of three times per day. Stay dry with a fashion umbrella that makes a statement or choose an umbrella which offers an app that will tell recipients whether or not it will rain! Umbrellas are a unique promotional product that get a lot of mileage and are warmly received by just about everyone, from your youngest hires to your most veteran employees. There’s also so much diversity among umbrella styles and functions that even somebody who already has a couple of umbrellas can always use one more. 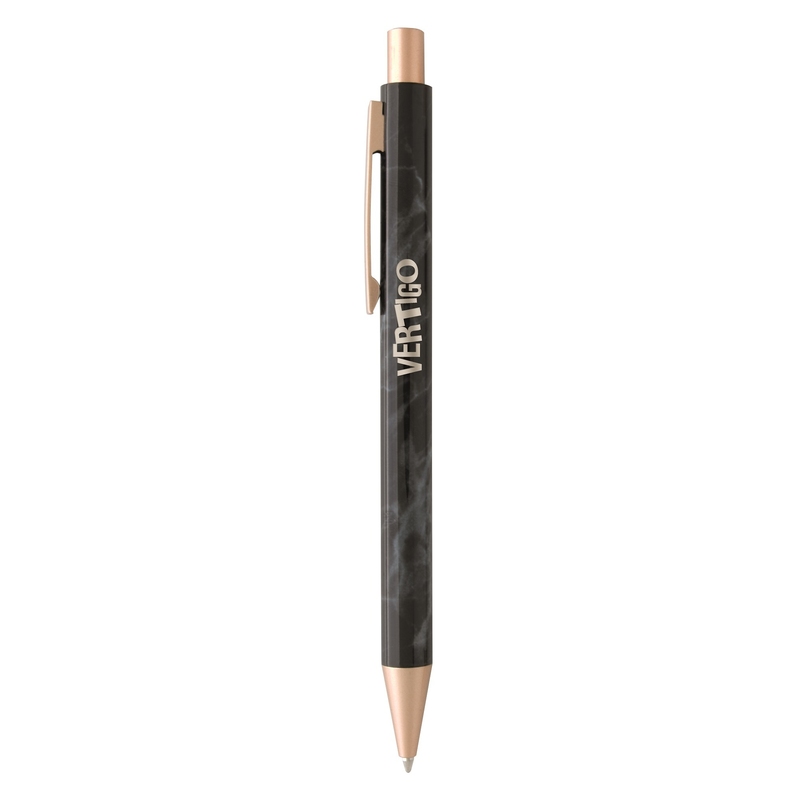 Everyone uses umbrellas, so you really can’t go wrong when choosing this as your promo gift. Our Inverted Umbrella with c-shaped handle makes for easy carrying. Umbrellas have excellent staying power, with an average life cycle of 14 months. Among Baby Boomers, it’s even longer – 59% keep promotional umbrellas for two years or more. And hey, if one gets left behind somewhere, someone else will come right along and adopt it. Go for special features that make your umbrella stand out, such as a built-in flashlight, a C-shaped handle for hands-free capability, or a chair clip. Fifty-eight percent of consumers report umbrella quality is the primary reason for hanging onto it. Customizable umbrellas are a big, blank canvas making it a perfect walking advertisement for your business. There’s ample room to show off your logo and messaging, and there’s an infinite number of possibilities when it’s time to select colors that match or complement your brand (even if your logo is an umbrella). Would you pay someone to walk around all day with a billboard for your business? When you use umbrellas as promotional gifts, you don’t have to. With so much use, it should come as no surprise that custom umbrellas generate an average of 1,100 impressions over their lifetime. 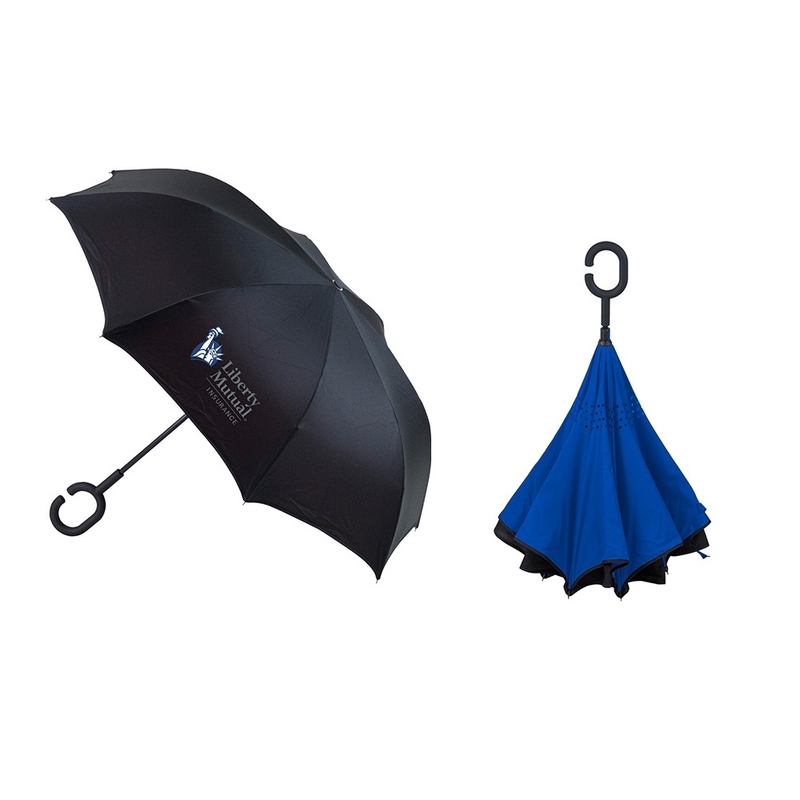 When you need an effective promotional item, an umbrella is an ideal pick. 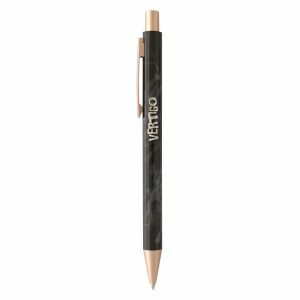 There are plenty of cool, fun, and interesting promotional items to give away, but it can be tricky to find a universal crowd-pleaser. 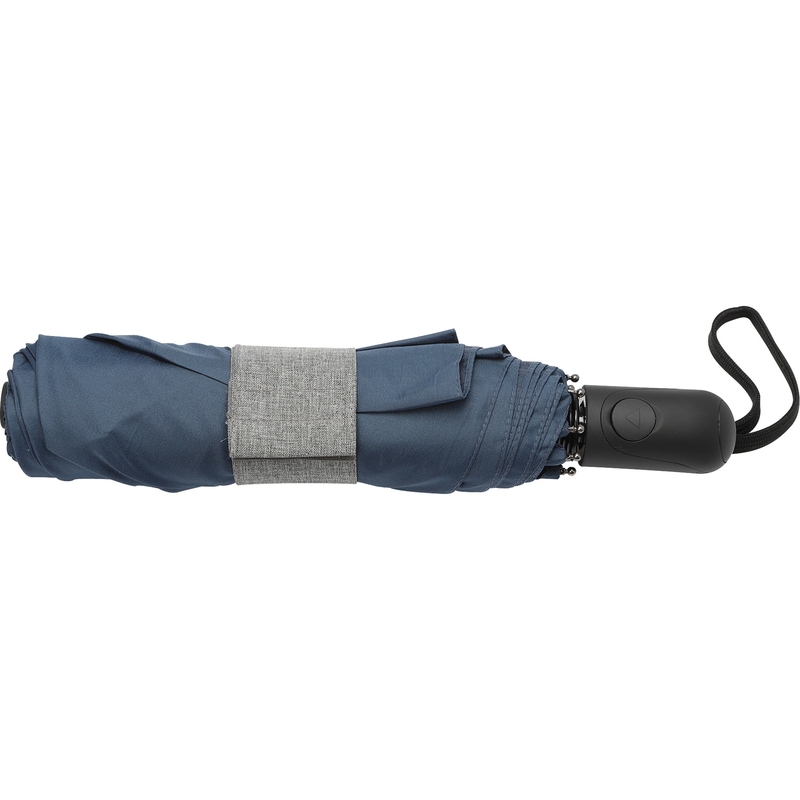 People are happy to receive something as functional as an umbrella, especially when it’s stylish or comes with cool features. Because they’re so practical, they rarely get tossed in the bottom of a drawer and forgotten. 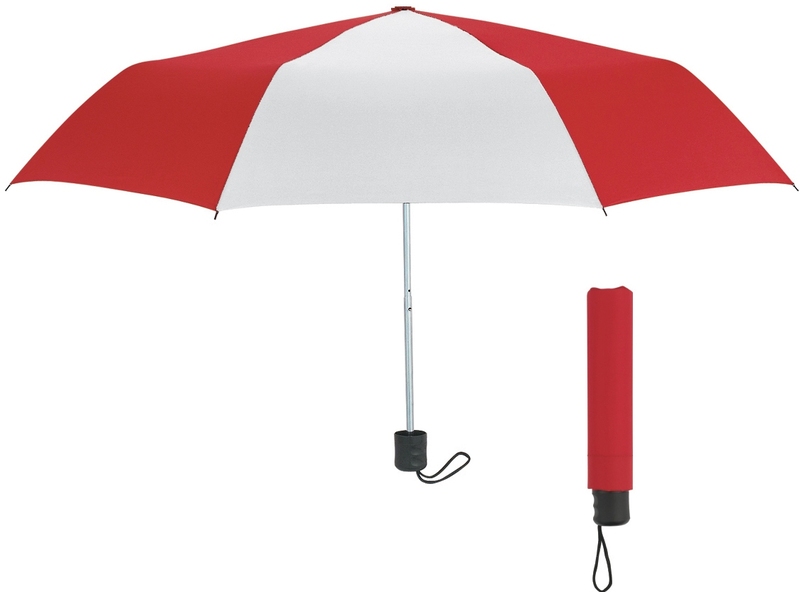 Our Telescopic Umbrella is a classic and comes in 18 different colors. While it’s true any old umbrella can keep you at least somewhat dry, they aren’t created equal. When you’re searching for the best umbrella to represent your brand, there are lots of choices. Opt for a classic umbrella that prioritizes utility,function and affordability, especially if you’re serving employees all over the country. If you’re creating gifts for a specific demographic, take a look at golf umbrellas or patio table umbrellas. If you’re looking for a gift that’s on trend this year, go for an inversion umbrella , which not only looks awesome but is cleverly designed to keep people dry as they get in and out of the car. Umbrellas are an ideal year-round promotional product that keeps your name top of mind every time it’s overhead. Thinking about spreading sunny smiles with a custom promotional umbrella? Start here. 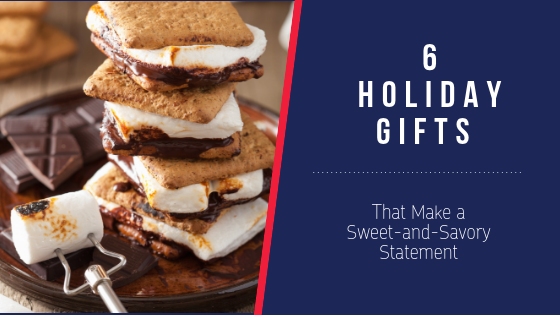 Everyone loves gourmet food gifts, no matter the time of year. We love them too, but we what makes us love them even more is when they include a gift that’s not perishable (we are in the branding business, after all). 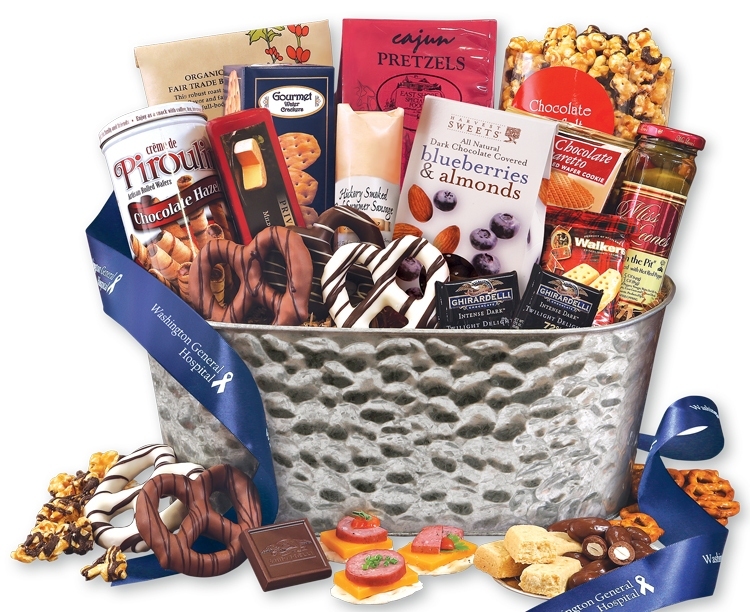 These gourmet treats are packed in reusable totes and coolers, for a keepsake gift your clients will love. Yes, the cookies are amazing. And, yes, there are nine different flavors packed in a single crate. 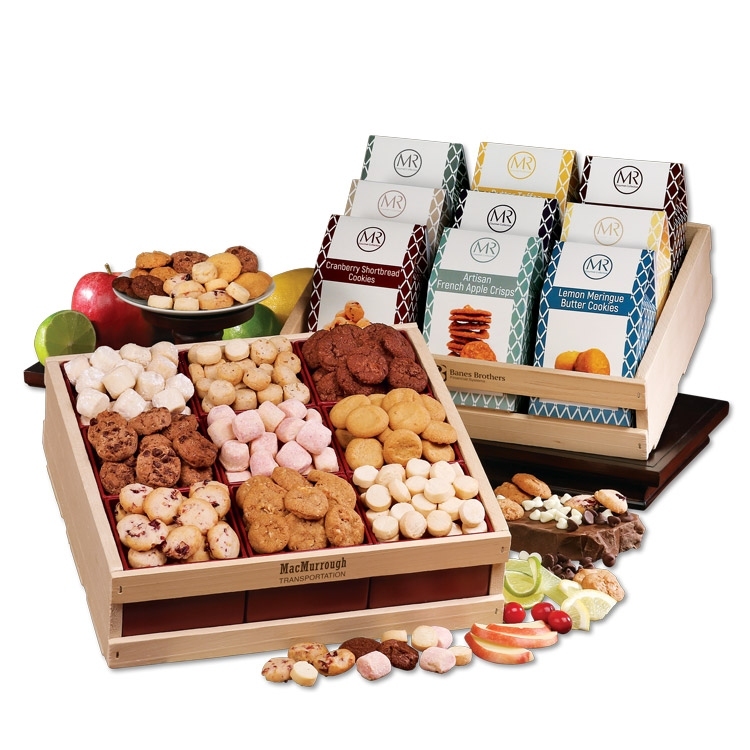 But, after they finish the last cookie in your Cookie Gift Crate, that wooden crate becomes a catch-all for their desk, upgraded inbox or, simply, a mail-drop by their front door. Regardless, every time they see this versatile crate, you’ll be top-of-mind. 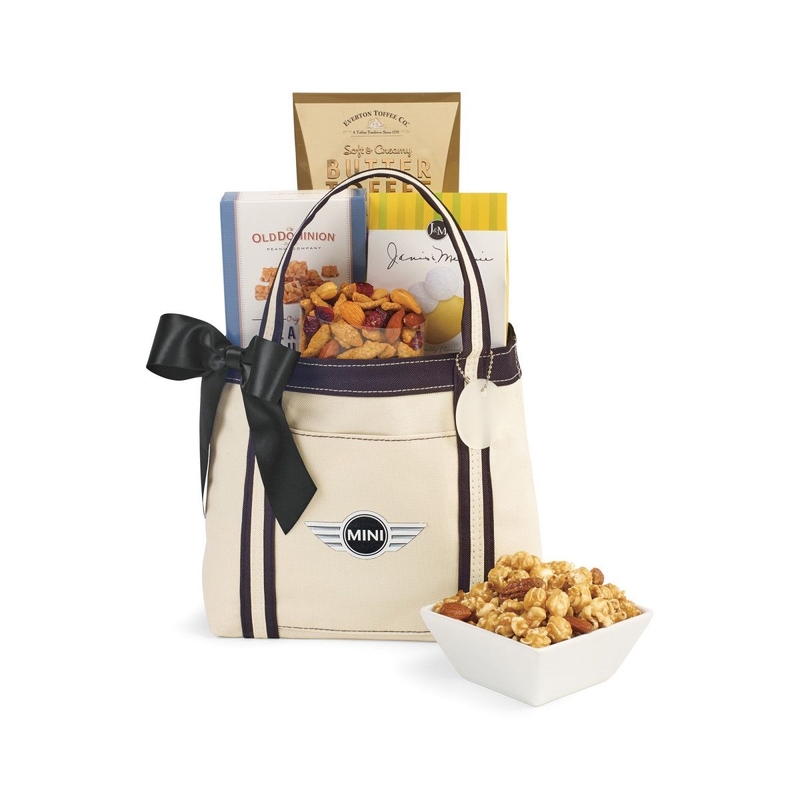 Snacks, drinks or even office supplies get loaded into the tote left over from this Sweet & Savory Gourmet Gift Caddy Tote, and your logo, branding and message travels all over your customer’s office and beyond. It’s a quick way to remind your client base that you’re in-it-to-win-it with them 24/7 – and with multiple pockets and compartments, it’s easy to stay organized and on the move. 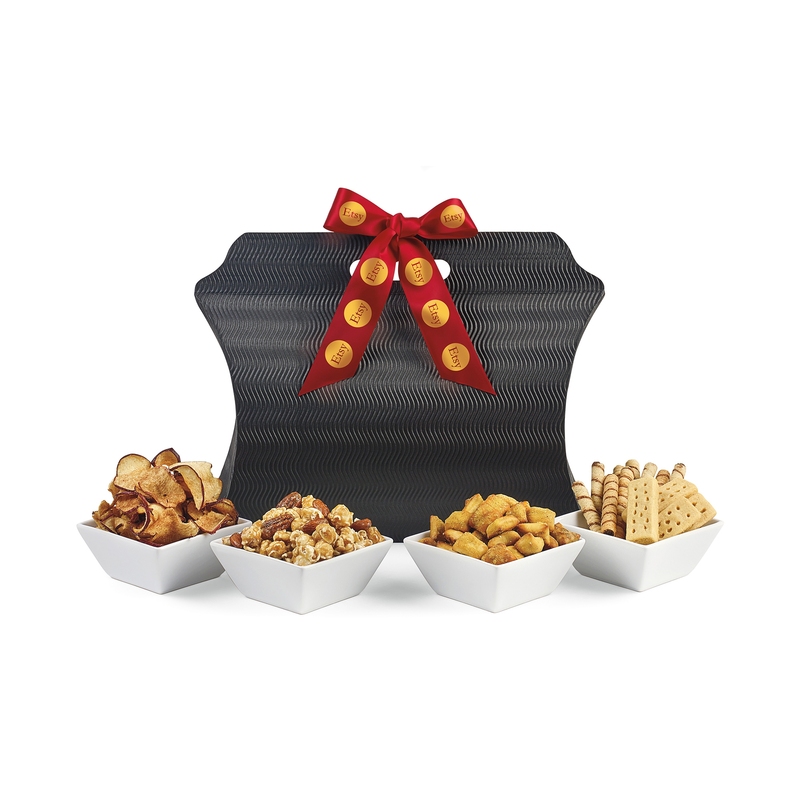 This Meeting Gourmet Snack Gift Tote is a total head-turner, with a unique shape that customers will want to show off long after they finish the popcorn, shortbread, apple chips, cookies and pretzels packed inside. Don’t be surprised if the tote finds its way onto your customers’ desks or becomes their new meeting carry-all. And when they’re asked where they got that super sleek, super chic tote? You’ll no doubt get kudos for the creativity. Everyone loves snacks, especially during the holidays. And, going a step further, everyone will love the raspberry honey mustard dip, pretzel twists, lemon cookies, apple chips, cookies, popcorn and all of the other amazing picnic faves packed into this Picnic Treats Gift Lunch Cooler. But the best part about this keepsake gourmet gift? When they’re done sharing and snacking, this tote becomes your clients’ new go-to lunch box. Because it doubles as a lunch or picnic cooler bag, they can pop their favorite lunchtime eats into this bag all year long. Not only will this bag be a constant reminder of your partnership, but your clients will know you’re always thinking of them – as will everyone who spots these bold branded totes in the break room fridge. Everyone loves – and needs – a great carry-all tote. Why not be the business that supplies it? That’s the power of this Gourmet Treats Gift Tote. As with our other holiday food packs, this one is filled to the brim with cookies, fruit and nut mix, caramel popcorn, peanut crunch and caramels. And when it’s empty? It’s a classic and totally on-trend tote, perfect for carrying anything from gym clothes for a post-work workout, meeting must-haves, travel essentials or, really, anything. It’s a great bag, period. And it’s a great bag you’ll be tied to every day when your customer grabs it and goes. Looking for the perfect gourmet keepsake? Get in touch to learn more and view our complete collection. We get it – your holiday gifting is locked and loaded. Maybe you give the same thing every year – who doesn’t love a full-bodied Chianti around the holidays? Or, maybe you mix it up and opt for the season’s most on-trend must-have. Regardless, you know your gifts are welcome and warranted. You are, after all, thanking your clients, partners and/or employees for helping your business knock it out of the park this year. That said, the holidays aren’t the only optimal time to reach out and say “thanks!” Now, more than ever, decision-makers are inundated with holiday gifts from early December straight through to the New Year. While that doesn’t mean you’re off the hook for a holiday gift, it does mean non-seasonal mailings will likely work a lot harder. Why? 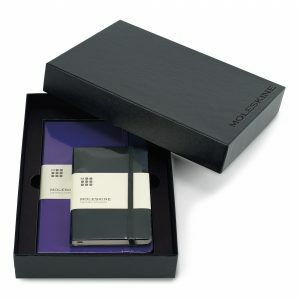 Not only will a gift outside of this present-heavy season cut through the clutter of junk mail and promotional emails, but your clients will appreciate the thought even more – when it’s not the holiday season, these “thinking of you” nods feel less forced and, hands down, will likely resonate more. Having a tough time getting a call or email back? Send a gift. Unless it’s truly a throw-away – which, let’s face it, you wouldn’t waste your money on – that client or prospect is almost always going to respond and thank you for the thought. It’s good business and, besides that, it’s common courtesy. So, do yourself a favor and stop the endless email/voice mail barrage and pop something in the mail. One final pro tip: while any gift should warrant a call or email acknowledgement, this is often a good example of “go big or go home”. Sending something larger really can’t be missed, even if it gets shuffled in with the day’s mail and call-back notes. 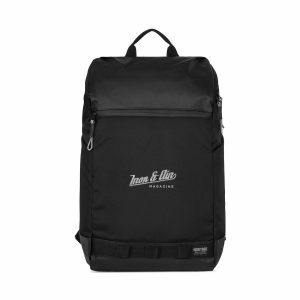 This Heritage Supply Laptop Backpack is a perfect example. It’s sizable, versatile and completely usable – who doesn’t hate hauling their laptop back and forth every day? And besides that, backpacks are having a serious moment. With so many adults dealing with back issues, many are turning to backpacks to help distribute the weight of their daily haul. In other words, double points for thoughtfulness. Showing appreciation and fostering a feeling of familiarity and mutual respect is essential to building any business relationship, clients included. By establishing a more regular “thank you/thinking of you” cadence, you’re fostering good will year-round and not just during the holidays or when they sign on the line. Again, it feels more genuine and more personal, which helps ensure your clients feel valued and appreciated. 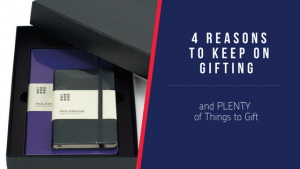 The trick, then, is to come up with corporate gifts that 1) are universally in-demand/useful 2) don’t break the bank but still have some serious oomph to them and 3) are in-sync with the clients’ wants and needs or, minimally, with some moment in time. For example, send this Marble Click-Action Pen around New Year’s, letting them know that, as they’re writing their resolutions list they should add “coffee with you” to their to-dos. Or, as summer approaches, pop these Faux Leather Power Banks in the mail as a vacation essential – there’s never a charger poolside when you need one. When temperatures start dropping, brand and send an Elevate Two-Tone Knit Half Zip, or this Thermos® Stainless King Travel Mug, perfect for something hot. Let’s face it – the branded fleece picnic blanket you sent last year was useful but, really, it was equally about getting your name and logo front-and-center with your latest and greatest client. Layering in an additional gift or, even, a continuity gifting program gives you an opportunity to focus on that essential partner and what makes them tick. The goal? Come up with some ongoing gifting program that goes beyond just Christmas and Hanukkah. Done right, this is the ultimate relationship-builder and booster, which can position you and your brand for success now and in the future – not just during the holidays. Think about your customers, what makes them tick and when you aren’t hearing from them as much as you should. Then, use that intel as your jumping off point to create a powerhouse corporate gifting program for your business. Call us, the Promo-Know How People, to get started incorporating Corporate Gifts into your marketing budget, today! From giving thanks, to giving gifts, to celebrating the new year, the entire holiday season is a time to spread delight! Giving gifts during the holiday season is about building long-term relationships with customers. It is not just putting your logo on a memento. Although it really is the thought that counts, put some careful thought into the gifts you are buying. When you want to show appreciation for individuals who have touched your business in the past year, look to our wonderland of ideas. Here you’ll find gifts to promote your business before, during and after the holiday season. Before: A lot of spending occurs during the holidays. The trick is to get your customers to spend with you and not your competitors. 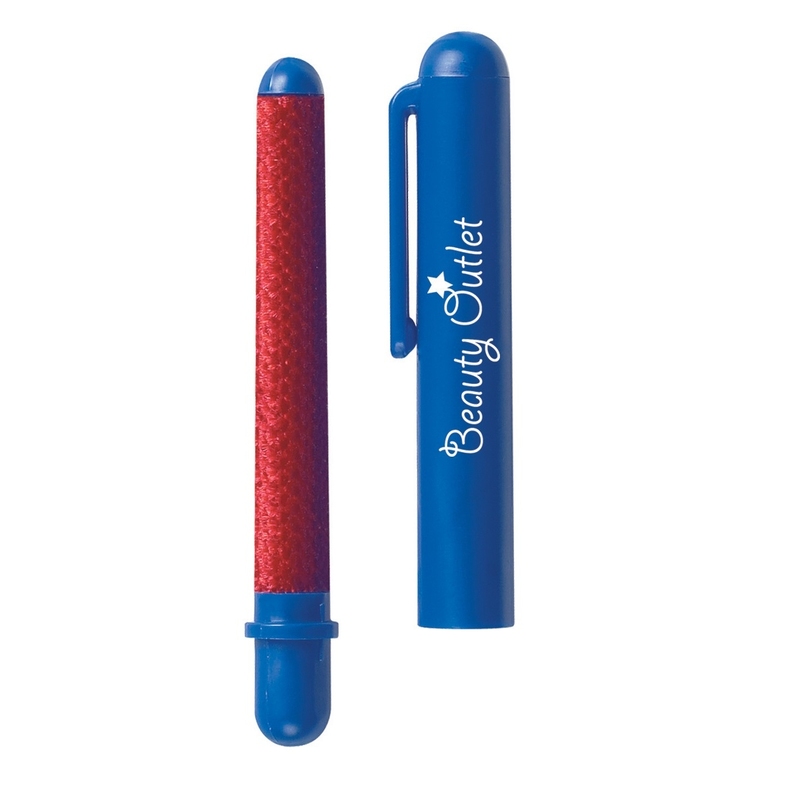 Entice them with a branded gift-with-purchase. During: The holidays are a popular time to advertise. So, it’s important to put thought into your marketing campaign. Share the joy and strengthen customer relationships by thanking customers with an impressive gift. After: Bring your promotions into the new year to keep relationships strong. You want to appeal to the everyday emotions while also standing out from the crowd. There are fun gift options for home, the office and outdoor events that can showcase your brand. The seasons of giving are fast approaching. Let us help you find a gift your coworkers and customers will actually enjoy. Here are a few of those brilliant products to keep the momentum growing for customer acquisition and retention. Just because it’s cold outside doesn’t mean the adventures cease. Outdoor enthusiasts will appreciate a gift to keep them warm and help them survive winter! You can encourage outdoor excursions from skiing the slopes, to tailgating, to enjoying the beauty of nature. Let your logo kick off winter exploration with a The North Face Jacket. 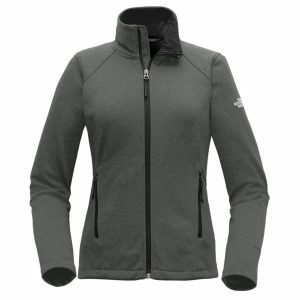 This jacket is the ultimate mid-weight option for active outdoor adventures! To keep spreading the warmth throughout the year, ePromos also carries scarves and touch-screen gloves. If you’re like many of us at ePromos, cooler weather means we move indoors and let our gourmet out. Let your logo make an appearance when customers take time during the snowfall to host a party, create a wine event or enjoy a cup of hot chocolate. To get you started in our gourmet promotional products, look at our Hot Chocolate on a Spoon. Delicious Belgian chocolate ensures your brand is noticed on a cold day. Clear the dining room table. Moving indoors also means it’s time for games, puzzles and artistic endeavors like grown-up coloring books. Fun times at home will leave a great impression on your brand. Everyone has places to go. 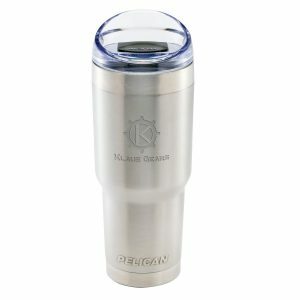 If your business wants to inspire the wanderlust in your customers, give away Pelican® Traveler Tumblers. They will encourage a year filled with warm beverages your customers can bring wherever the season takes them. Other ideas for traveling are emergency auto kits, charging accessories and travel alarm clocks. Don’t dread shopping for gifts for your customers. It’s cold out, but the game is on. Customers will head to the stadium in your gift of warmth. 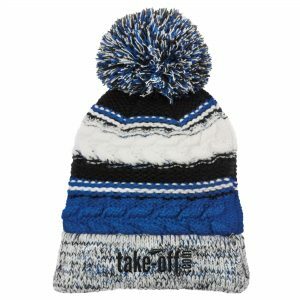 This toasty Pom-Pom Beanie is as unique as you are and will give you the attention you desire! Hats are an appropriate gift for six months of chilly weather. To show appreciation, look for meaningful business gifts that will create lasting memories well into the new year. Some more personal ideas include photo frames, portfolios or desktop accessories. Maybe your target market prefers to hunker down at home. If you are looking for a gift with a personal touch, a gift that will find its way home, give a gift of comfort. 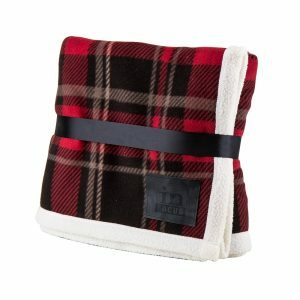 One idea is the Plaid Sherpa-Lined Blanket. This extraordinary blanket will hang around the homebody household for years to come. But, we have other gifts for the home like branded candles, night lights and essential oils too. Have you found what you’re looking for? ePromos has thousands of unique products. These promotions will end your business year with a bang and cheer on a tremendous 2018!